We’re going to start out look into the high-end touring bicycles with the Koga Miyata Traveler. This company offers numerous options for touring, but we’re going to look at their lowest price tourer first. Please comment if you have ever ridden, owned, or know anyone who owns this bike. Email photos of your setup to me at recklesscognition@gmail.com and have them posted on this site. Frame- Triple butted aluminum frame. Weight- Nearly 38 pounds, loaded with accessories though. Let’s have a look at this impressive bike. That is quite a package. The components are good, the gears have a great low range, it is ready to tour on almost all terrains. This is a serious bike. But is it worth the price? Check the ratings. Value. Although the price is much higher than the other models we’ve look at up to now, this bike is fully equipped and has a dynamo hub on the front. Figuring in the lack of upgrades needed, it is conceivable that this bike, without all the accessories would be worth about $1,600 saying there are about $500 dollars worth of accessories on the bike. Now we can compare that figure with what you get on the basic bike. 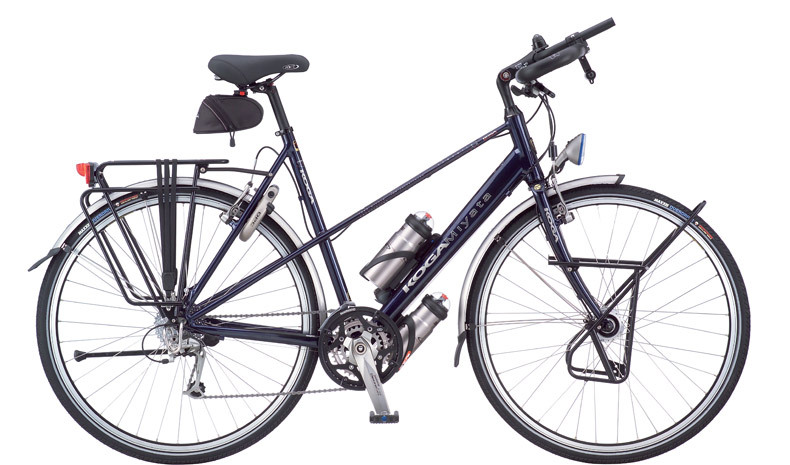 Compared to other bikes in the $1500-1800 range gives us our value rating. I like the dedicated line of Deore LX components, but wonder if they are worth that extra money. A LX build kit can be had for about $700, while an XT is about $950. A regular low-end Deore kit is $625. That makes the difference in equiptment about 75 dollars between just about every bike we’ve reviewed and this one. The total price difference is much more than that, making the value rating low. Granted, this is a high quality, hand-crafted frame, but does that matter to you? Quality. High quality frame, lifetime warranty as long as it isn’t used professionally. Compliance. This bike is a truly dedicate touring bike. Everything you need to tour is built into the frame, ready to load up and go. You can see it in the picture, read it in the specs, and feel it on the road.